Sunday's referendum in Crimea will see the region decide in favor or against secession from Ukraine. While Russia fully supports this political maneuver, the West sees it as a major breach of international law. Crimea has been part of Ukraine since 1954 and is an autonomous republic within the country. Its population mostly consists of Ukrainians, Tatars and Russians, with Russians making up the largest group. Due to its size, it would be easy for the pro-Russian population to determine the outcome of the secession referendum. Crimea's unification with Russia is therefore very likely. In the days - and even hours - ahead of voting, diplomatic channels were in overdrive. DW looks at the parties involved in the conflict and their interests. Shortly after ousted Ukrainian President Viktor Yanukovych fled to Russia, the Russian government took matters on the Crimean peninsula into its own hands. Soldiers without official national designations on their uniforms occupied all strategic locations in Crimea - although due to its Black Sea fleet base near Sevastopol, Russia already had a strong military presence in the region. 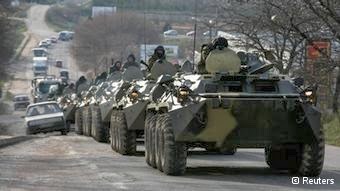 Russian President Vladimir Putin, however, has denied official deployment of Russian troops in Crimea, referring to the patrolling forces as "local self-defense units." Russia to "respect results of the referendum"
The referendum on whether Crimea should unite with the Russian Federation has been welcomed by Kremlin officials. However, the official statement is that Crimea's residents should decide about their own future. Russian Foreign Minister Sergei Lavrov has reaffirmed that Russia would "respect the results of the referendum." The financial cost of the vote has been mostly covered by Russia, which injected around 1.5 million euros ($2.1 million) into the poll. Putin has made it clear that, from the Russian perspective, the referendum does not breach international law. After the change of government in Kyiv following months of protests, Crimea also underwent political restructuring. Crimean Prime Minister Anatolii Mohyliov was dismissed and replaced with Sergei Aksyonov. He is not recognized by the new Ukrainian government but is recognized by Moscow as Crimea's leader. Aksyonov quickly got to work organizing a vote to decide on Crimea's future and called on Russia for assistance. He supports Crimea's speedy secession and integration into the Russian Federation. Putin and the Russian parliament have already signaled their approval of the move. Ukraine's new government under Prime Minister Arseniy Yatsenyuk and President Oleksandr Turchynov declared the Crimean referendum a Kremlin-orchestrated "farce." According to their statements, Kyiv is not prepared to treat the outcome as legitimate. Yatsenyuk said Ukraine would never surrender in a fight to maintain its state territory. In practice, however, the Ukrainian leaders' hands are tied. Russian forces are in control of Crimea and Ukraine would probably not allow itself to enter into armed conflict with Russia over Crimea. The United States has announced its refusal to recognize the referendum's outcome, declaring the vote to be illegal according to international law. US President Barack Obama has stated that the move would have harsh consequences, including economic sanctions and a possible expulsion of Russia from the G8. 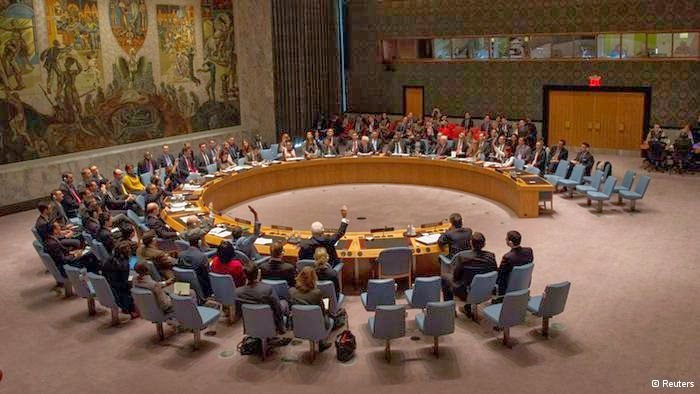 Russia has largely isolated itself within the United Nations Security Council. On Saturday (15.03.2014), the US put forward a resolution to the Council that declares the Crimean referendum as illegal and emphasizes Ukraine's territorial integrity. Russia had vetoed the resolution. 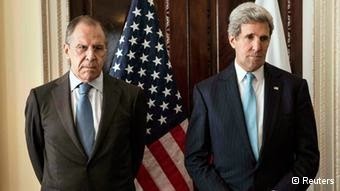 US Secretary of State John Kerry met with his Russian counterpart, Sergei Lavrov, on Friday to work on a diplomatic solution to the crisis. However, neither side was ready to make any concessions. Kerry said the Crimean people's desire for more favorable economic conditions could be met through improvements in the region and respecting the locals' complaints. The European Union has deemed Russia's actions contrary to international law and is not prepared to recognize the outcome of the Crimean referendum. At the same time, however, the EU does not have a clear-cut strategy in place to deal with the vote. It has already imposed initial sanctions on Russia, but British Foreign Secretary William Hague said tougher restrictive measures than the ones already introduced by the EU are in order. On the other hand, Luxembourg's foreign minister, Jean Asselborn, has voiced concerns about the effects of possible sanctions, urging a cautious approach to the issue. He confirmed, however, that the EU ministers would impose EU travel restrictions on Russian politicians should Moscow not give in. He added that the initial travel sanctions should only affect those who played a deciding role in Crimea's split from Ukraine. EU foreign ministers are expected to meet on Monday to discuss the result of the referendum and hash out a response. Among EU countries, Germany has the best relations with Russia and its opinion is more likely to be acknowledged by Moscow than that of the other states. Strong economic ties bind Germany and Russia: Germany imports most of its gas from Russia and operates many businesses in the country. German Chancellor Angela Merkel has nevertheless made her view on Russia's role in Crimea clear. 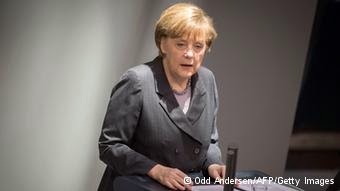 Should Russia refuse to return to the path of "law and cooperation," Merkel said, it would cause "massive" damage to its political and economic interests.